Pets can’t usually tell us when they are hurting. Dental issues or arthritis may be the reason your fur baby isn’t bringing back the tossed ball, batting at a piece of string, running in the yard or even taking time to properly chew his food. His lack of interest may be the result of an issue that can be easily fixed. He simply doesn’t have the words to tell you that he is in pain. 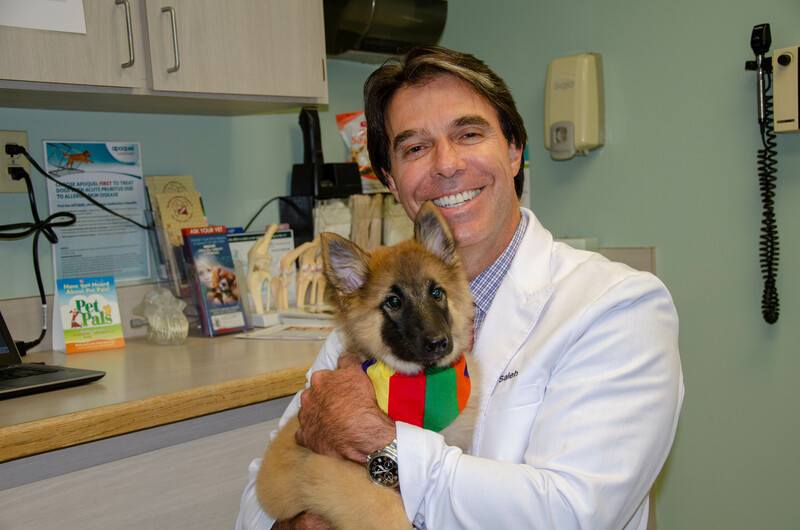 A visit to Dr. Farid Saleh and Ehrlich Animal Hospital and Arthritis Therapy Center can often bring a resolution to a pet’s lethargy. 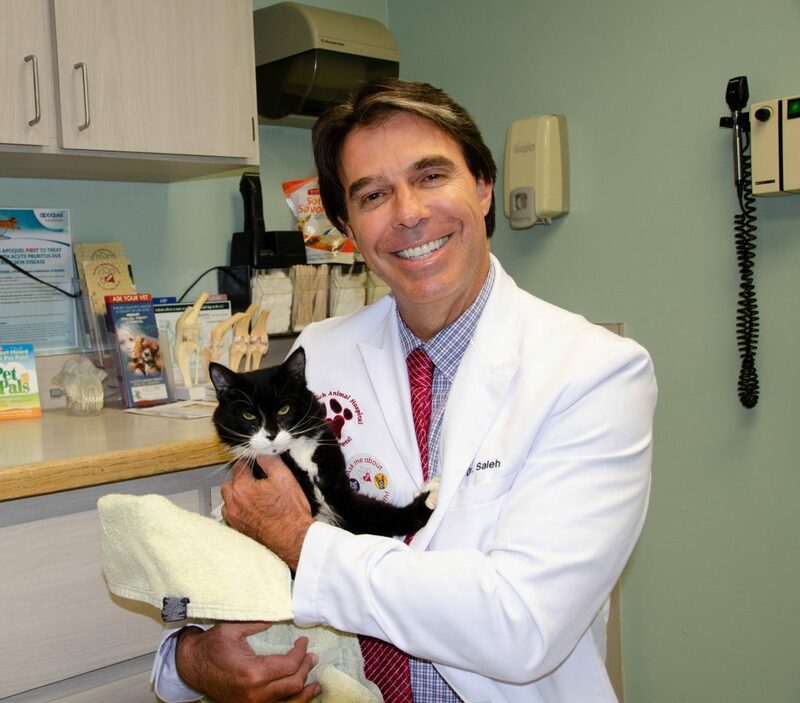 Alternating between cuddling a recovering cat and a client’s 11-week-old puppy, you need only look at how Dr. Saleh’s face lights up when talking about helping animals to know this veterinarian loves his craft. While growing up, his family was in human medicine, but Dr. Saleh always adored animals and decided to use his medical skills to provide for those without a voice. 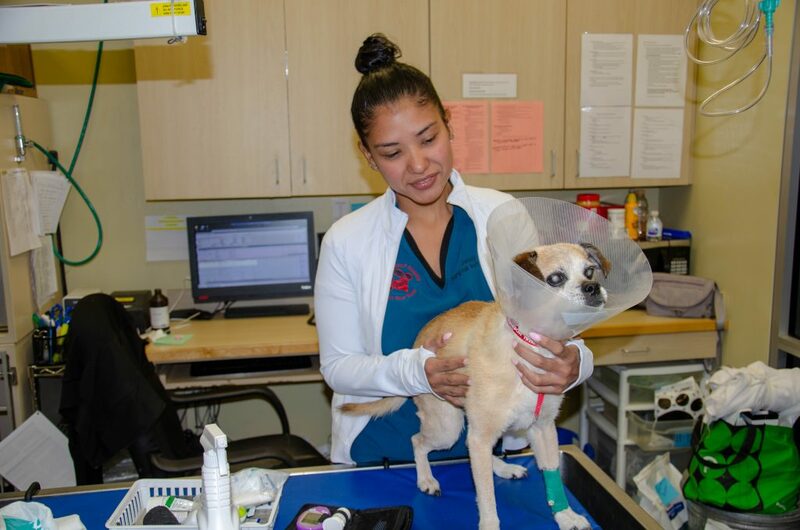 Open seven days a week, the practice has five full-time veterinarians who provide compassionate care to dogs, cats, and exotic pets like rabbits, guinea pigs, birds, and reptiles. Services include puppy and kitten wellness examinations, senior wellness, digital xrays, ultrasound, surgical laser procedures, dentistry and oral surgery, hospitalization of sick pets, medical evaluations and workups, orthopedic and soft tissue surgery, cancer treatments, boarding, and grooming. Treatments for arthritis therapy include stem cell therapy/platelet rich plasma, laser therapy, medications and nutritional supplements. Beginning after Labor Day, the practice will be remodeled by converting a part of the boarding facility into additional hospital space. The new space will accommodate a water treadmill, a new dentistry suite and more hospital and treatment areas. They hope to be completed by Thanksgiving. “We will be expanding our current rehabilitation programs. In addition to our therapy lasers, we will be adding a water treadmill. 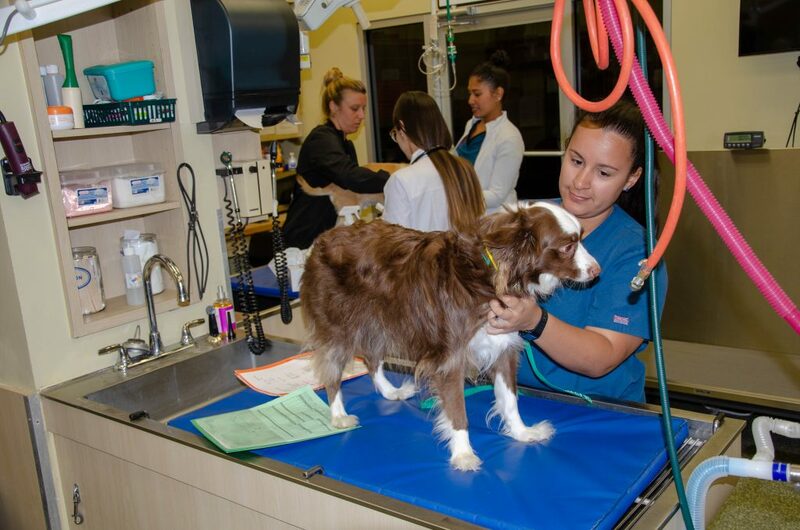 It will provide heated hydrotherapy in addition to many medical exercises for pets. One of our nurses is getting certified in rehabilitation therapy. Water rehab is beneficial for Arthritis, muscle soreness, postoperative recovery and promoting weight loss. Pets suffering from obesity can come for therapy so they can exercise and lose weight without harmful impact to their joints. A pet parent may realize and react when their dog or cat is suffering from arthritis or other ailments, but dental issues may go undetected for an extended period of time. Some owners are totally surprised when a dental exam reveals tooth extractions are needed. “It shocks them because their dog is “eating and acting normal”. The pet doesn’t cry and he doesn’t stop eating, but then you take care of his mouth and you see a total difference in their behavior,” he said. “If a pet has a swollen jaw or bleeds from his mouth, everyone can tell there is a problem. It’s the ones that are just wagging their tail, walking around and acting normal that is more difficult to assess. It’s not the owner’s fault – but they misinterpret what’s going on because pets do not show symptoms as easily as humans. We perform CORE (Comprehensive Oral Assessment and Radiographic Evaluation) procedures.” Not long after we do this procedure, the owner will tell us that his pet is completely different. He’s playing – he’s doing things he hasn’t done in many years. “I just thought he was old! I never knew he was in pain!” – is a common response. When a pet is dealing with pain, the signs may be very subtle. It is easy to detect when the pet is vocalizing or moaning, but that most likely only happens when they are in advanced pain. Some signs of pain in pets include panting, drooling, licking, inactivity, limping, lack of grooming, irritability and in worse cases biting. “Our goal eventually is to have pet’s teeth evaluated and cleaned annually,” he said. “Starting at the age of 2, we want to clean pet’s teeth on a yearly basis. The benefit of a CORE procedure is that we can do a full oral examination, and x-ray the teeth while the pet is under anesthesia. There are so many things you see in an x-ray that is under the gum line that you can’t see with the naked eye – like a tooth with a broken root that will cause pain. By just doing a cleaning and not x-raying the teeth, significant issues can be missed. Dr. Saleh recommends a physical exam yearly for young pets. For Senior pets (7 years and older) he recommends a physical exam combined with blood work and X-rays twice a year. As pets get older they age much faster and the sooner we can identify an illness, the better it can be treated or even cured. Six months may not seem a long time in a human but in a senior dog or cat a lot of things can change in that time frame. Ehrlich Animal Hospital and Arthritis Therapy Center is located at 8009 Gunn Highway Tampa, FL 33626. Hours are 6:30 a.m. to 8 p.m. Monday through Friday; 8 a.m. – 6 p.m. on Saturday and 10:00 a.m. – 5 p.m. on Sunday. 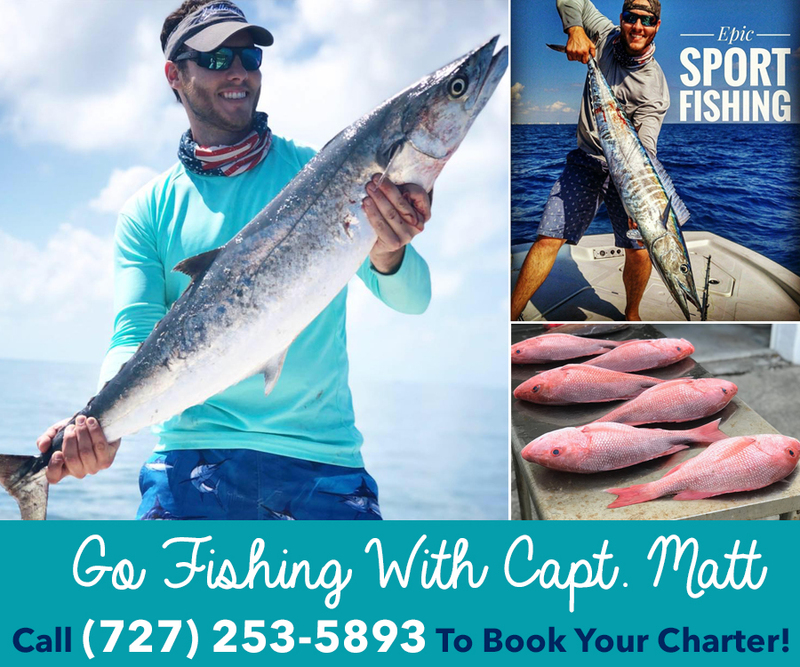 For more information or to schedule an appointment, call 813-920-0566 or email ehvet@ehrlichanimalhospital.com. You also can get more information from their webpage www.ehrlichanimalhospital.com or on Facebook at https://www.facebook.com/EhrlichAnimalHospital. Previous articleAn Affordable Diet Program That Actually Works!